Upcycling is a method in which old or discarded materials are converted into something reusable. The difference between upcycling and recycling is simple. Recycling takes consumer materials such as plastic, paper, metal, and glass and breaks them down so that they can be made into a new consumer product (usually of lesser quality). When you upcycle an item you aren’t breaking down ant materials, just purely refashioning it. Additionally the quality of the upcycled item has same or even better quality than the original. Upcycling is beneficial towards the environment because the act saves or removes materials from the waste system. It also requires less energy than recycling and encourages innovative thought process. There are a lot of antique elements in The Conscious Club, antiques add a sense of warmth, history, and character to your building. A nice plus is that it also holds it's value! Did you know that all of the tables at The Conscious Club are self-made from antique and upcycled wood? We made the tables in The Green Temple from 300 year old oak floor boards from the famous Wester Tower. This is the same oak from the 1700's, where they made all of the V.O.C. ships from and you can still see this wood back in the ceilings of old Dutch churches like the Oudekerk. The wood from our flyer table in the hall comes from an old farm and we've transformed old army lockers into tables for our café area. All of our doors, except for the dressing rooms, are from the 1800's and from Kramer Antique . Antique doors are designed to instill a sense of elegance. Today, these same doors can create a historical feel in any doorway. Besides that they give the building instant character. You can recognize the difference between modern doors and antique doors by the unusual big width they have. The antique glass room dividers in The Green Temple are also from the 19th century which gives The Green Temple it's own unique feel. For the kitchen we've used antique closet doors and turned them 3-door system. At Kramer Antique you can find a great collection of antiques. With their 70 year history of selling antiques and their long-term experience, they have established their name within the Spiegelkwartier art district of Amsterdam. This bathroom wall is decorated with white glazed tiles from the seventeenth and eighteenth century. The tiles with a figure date from the years 1660 to 1680 and were made for Amsterdam canal houses. Usually they were seen inside kitchens, fire places and lavatories. Not a single white tile has the same coloration, creating a lively appearance on the wall. All of our benches are handmade and when you sit on a bench at The Conscious Club it's always one with a story! The benches in the locker rooms are made from the beams of the old ceiling at Studio 150. Studio 150 is an old music recording studio and many famous artists such as David Bowie and Prince recorded songs there! The Studio was demolished but we kept the memory alive by giving it new life! The green steel benches in the café area are by our own design. It also has some extra girl power in them, because we welded them ourselves! The large wall bench in The Green Temple is made from old pallets we found on the street. We cut the wood into pieces and reused it as the wood for the bench. We painted it white with organic lacquer paint of AQUAMARYN. The build in lights are sustainable led lights and can be turned into any color! Did you know that the chairs in The Green Temple are also upcycled? We have an unique collection of vintage Mauser design conference chairs. The bar is self-made with leftover wood of the rebuild at The Conscious Club. We've made full use of the wood available and the boys of 20tree turned it into the bar it is today! We used environmentally friendly, safe and organic resin for the top of the bar. Vegetable oil-based epoxy resin have low levels of volatile organic compounds "VOC's" or detectable fumes, is non-toxic, classified as food safe and even hypoallergenic! In The Conscious Club you find many different religious statues from Hinduism, Buddhism and Shamanism. We display them for protection and the clearing of the path to enlightenment. When you enter The Conscious Club you are immediately welcomed by Ganesha. Lord Ganesha is one of the best-known and most worshiped deities in Hinduism and his elephant head makes him easy to identify. Lord Ganesha is the gatekeeper at The Conscious Club and you can also find him in The Green Temple and our Zen Hall. 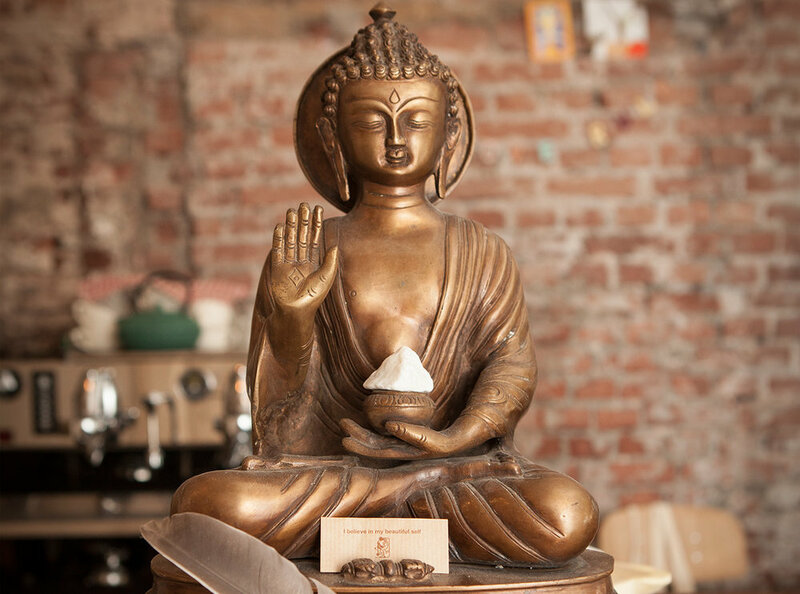 You can find an antique bronze statue of the original Buddha, Siddhartha Gautama, at our bar. Buddha was a teacher of the paths to eliminate suffering and reach nirvana, after he himself attained enlightenment. In our café you can find a beautiful statue of Krishna. Krishna is the god of compassion, tenderness, and love in Hinduism and is one of the most popular and widely revered among Indian divinities. Remembering Krishna, reminds us of the purpose of our existence. Doing deeds from the depths of our consciousness, ensures that we shall never go wrong. Shiva is the "destroyer and transformer" within the Trimurti, the Hindu trinity that includes Brahma and Vishnu. In Shaivism tradition, Shiva is the Supreme being who creates, protects and transforms the universe. At the highest level, Shiva is regarded as formless, limitless, transcendent and unchanging absolute Brahman, and the primal Atman (soul, self) of the universe. Shiva is also known as Adiyogi Shiva, regarded as the patron god of yoga, meditation and arts.